A brief introduction to the Rabbinic Tunnels follows. 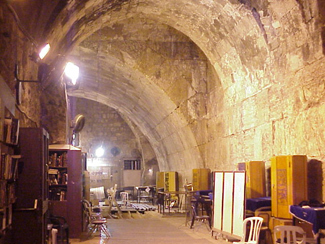 The Rabbinic Tunnels are also called the "Western Wall Tunnels." The main tunnel stretches north, 1115 ft. [340 m.] along the Western Wall of the Temple Mount (the Haram esh–Sharif) underneath the Muslim Quarter of the Old City of Jerusalem. From Wilson's Arch the tunnel passes the "master course" of stones, Warren's Gate, a spot near the Holy of Holies, an ancient quarry, a Herodian street, standing columns, and a Hasmonean aqueduct. Also see the Monumental Hall and the Priestly Miqveh. To view the "Western Wall Excavations" Click Here. This area has been under excavation by the Israeli Ministry of Religious Affairs since the end of the Six Day War in 1967. For additional information see — Bahat, Dan "The Western Wall Tunnels." Pp. 177–90 in Ancient Jerusalem Revealed: Reprinted and Expanded Edition, ed. by Hillel Geva. Jerusalem: Israel Exploration Society, 1994/2000.